Here we are! 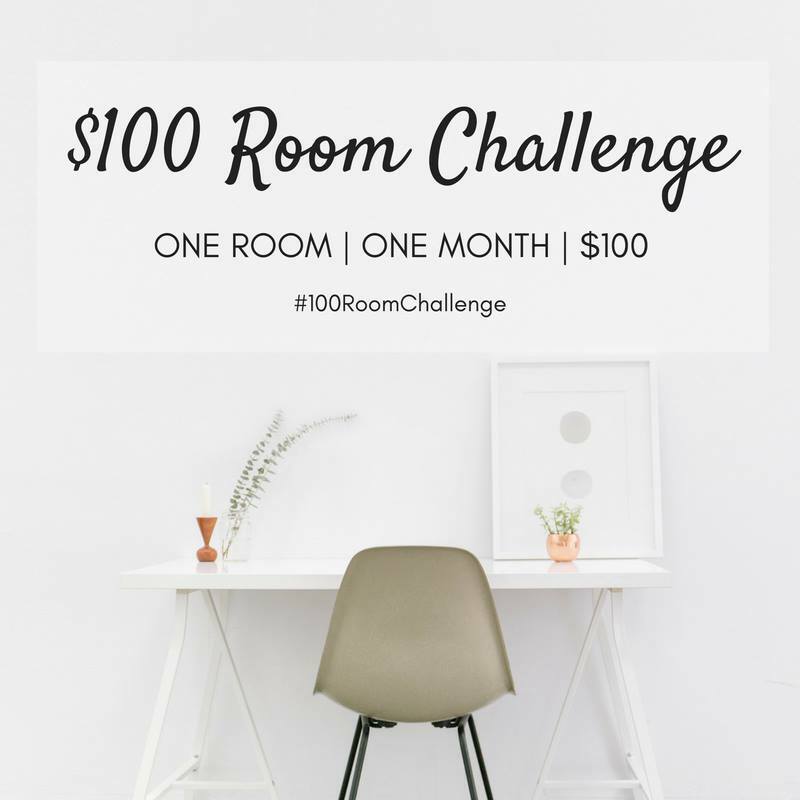 Entering our first $100 Room Challenge! 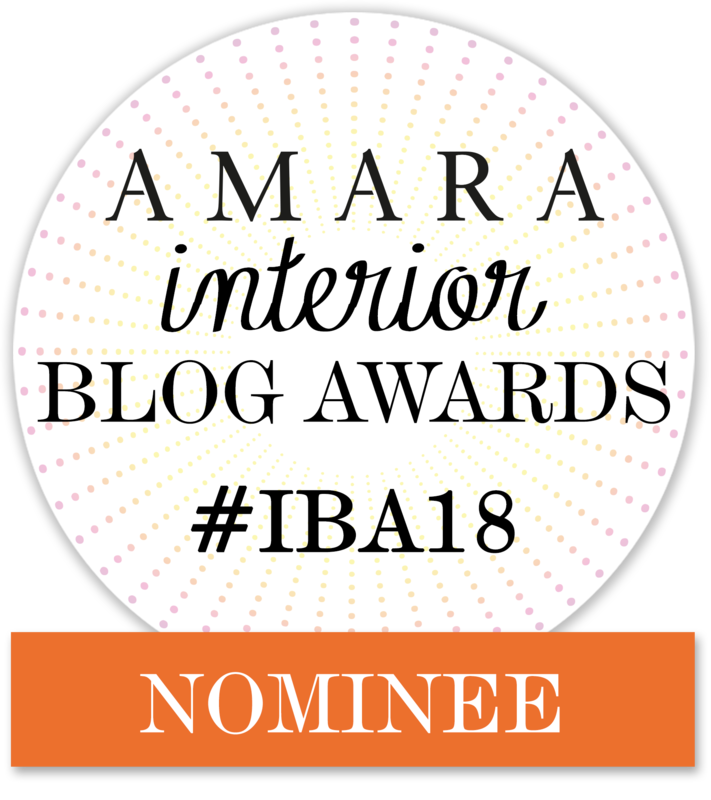 Now that the busy holidays are past, it is time to gear up and move forward along with some of our other blogging friends. A big “Thank You” to Erin from Lemons, Lavender, and Laundry for organizing this event! It is pretty much how it sounds, we will all be taking one room in our houses and making it over using only a $100 budget! How cool is that? Hopefully you, our wonderful readers, will get inspired to re-paint, re-decorate, or create some great DIY projects on this month long journey with us! We decided to tackle the main bathroom in Vicki’s upper level. She will introduce the space and let you know the plan for the makeover. This bathroom in my upper level is used by my kids when they return home from college, or the married ones if they come to stay. 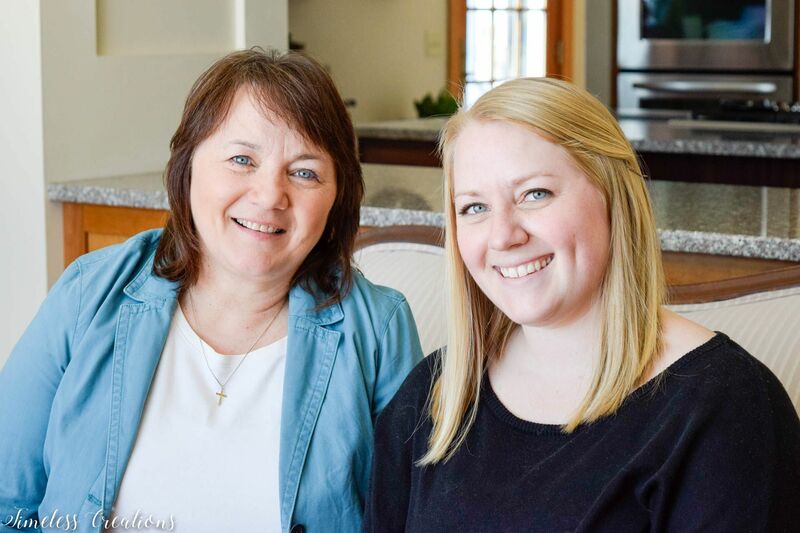 It is also used by any other overnight guests that we have been blessed to have. This is rather embarrassing but, this bathroom still has the builders white walls! (And it has been 10 years since it was built.) I would say it is definitely time to change this out! 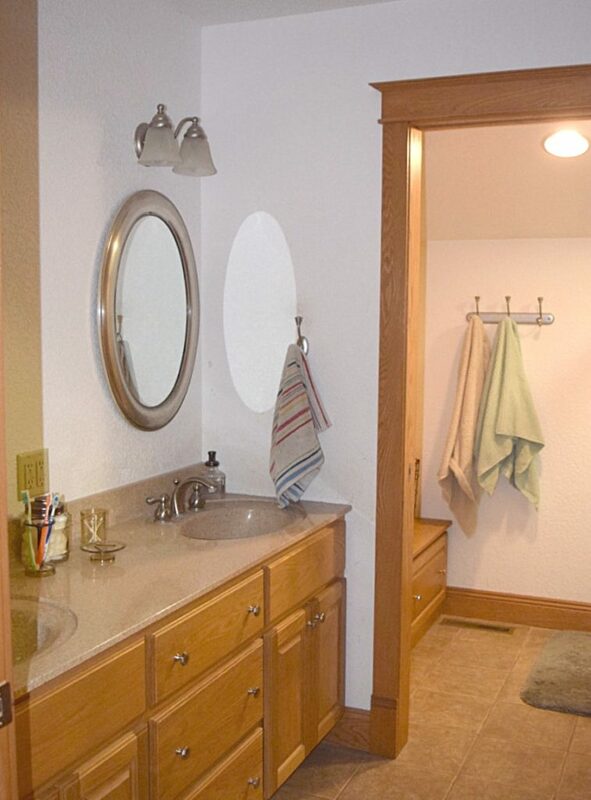 Here is a look at the space, sorry no natural light-as no window was included in this bathroom. 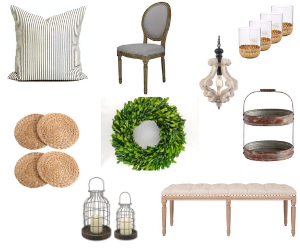 For this $100 Room challenge, here is what I am thinking I will do to make it over and still stay within the budget. My hopes are for a bright, cheery space but with a more sophisticated look and updated decor. I’ll see what I can accomplish within the budget. 2.) Redo the mirrors – Since mirrors are rather expensive to buy, I am planning to re-do the existing mirrors that are currently in the space. This should keep us within the budget. I am thinking I may deepen the silver to more of a pewter and bring out the beading detail around the edges more. I could also go with a white (well off-white for me!) painted mirror. Hmm…We will have to see what I decide on this one too! 3.) Add shelving over the stool – I have been wanting to put shelving up on this blank wall for some time now (See picture below). I just hadn’t decided what I wanted to do. 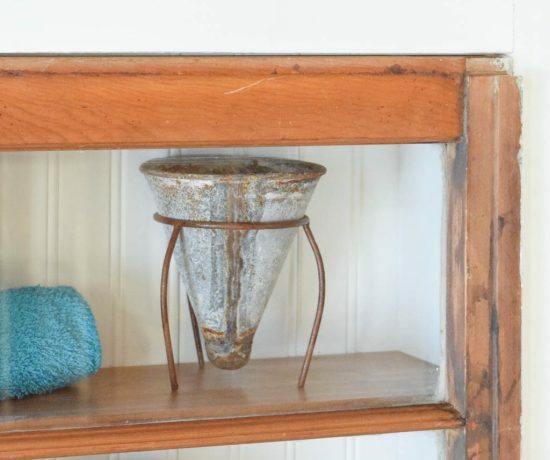 But here is what I am thinking: Two stained, chunky shelves, one above the other, with some kind of brackets – probably metal. Hmmmm…or I could do a chunky wood bracket…so many choices! I want these shelves purely for decor as I have plenty of storage space already for towels and other bathroom paraphernalia. I am planning these shelves as a DIY project that Kristen and I will make (Stay tuned for the tutorial!). Again, this should keep me within my budget, plus I love DIY! 4.) 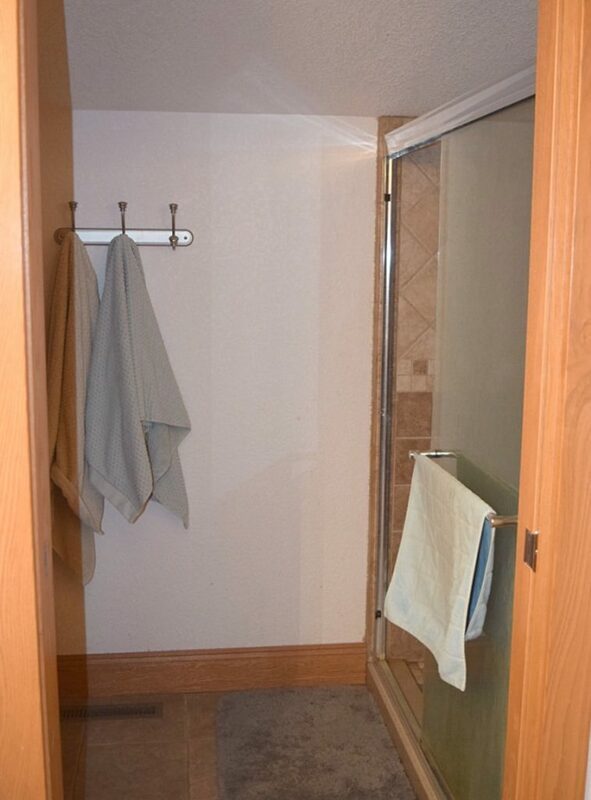 New towel hooks – Did you notice the towel hooks on that back wall by the shower? Well, I am ready – so ready- for something different there! Again, I am thinking of doing the stained wood with hooks – perhaps the same as the brackets on the shelving that will be above the stool. 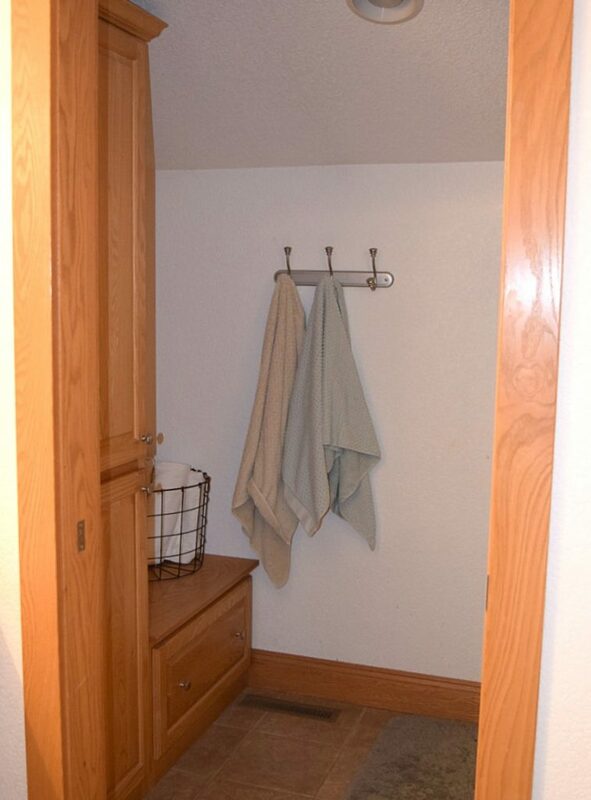 I want this towel bar to tie-in with those shelves, both in style and color. 5.) Update the decor – Last, but certainly not least, I desperately need to update the decor- in some cases add the decor. 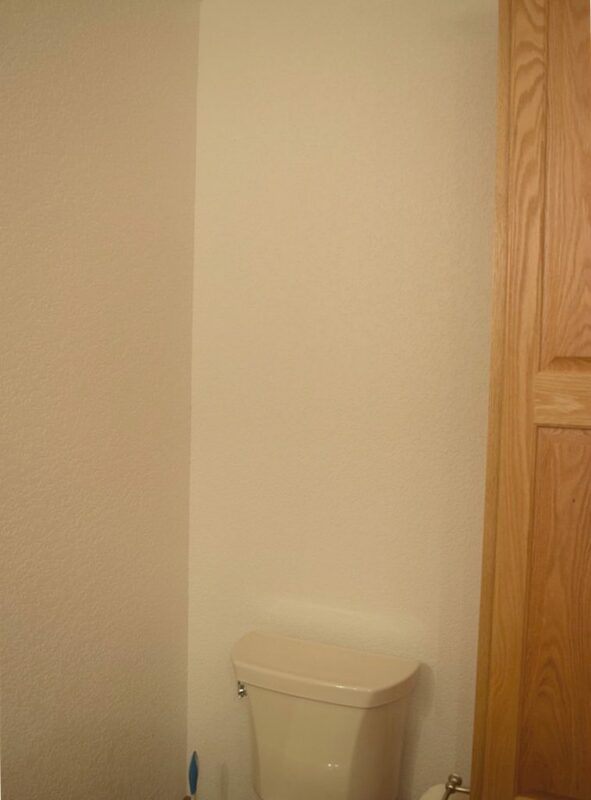 Remember that blank wall above the toilet stool? Yup- that wall definitely needs something. Since I love cute little quotes, candles, potpourri and such you can bet some of that will be added to this space! My plan here is to buy a very minimal amount perhaps a pretty new rug and a couple of hand towels. 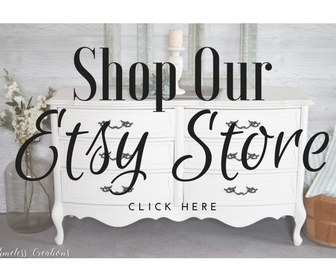 Other than those minor bought items, I plan to…yup-you guessed it-DIY! Maybe a favorite quote or two will end up as a DIY project. Otherwise, I plan to “shop” my house, where we round up a few things from my stash of decor items in storage or from other rooms. 6.) Update the hardware – I’m not sure if new hardware is going to fit in the budget right now. If not (and time permits) the plan is to again deepen the color to more of a pewter color, with the darker accent in the grooves of the existing hardware. And that is the plan for our first $100 Room Challenge! I would love to hear your thoughts, and make sure to follow along on our journey to a transformed bathroom. This is going to be such fun! Also, don’t forget to see what room everyone else is doing with their $100 budget! Links are below. And also, take a peek at our updates and final reveal! We are doing a bathroom too. It should be interesting to see what happens this month with all these room makeovers. Nice! We will be anxious to see what you do too! So much fun! So many great ideas for this space. I love your idea for the chunky wood shelving. It’s amazing how much money you can save by simply DIYing your projects or shopping your house to use what you already have on hand. 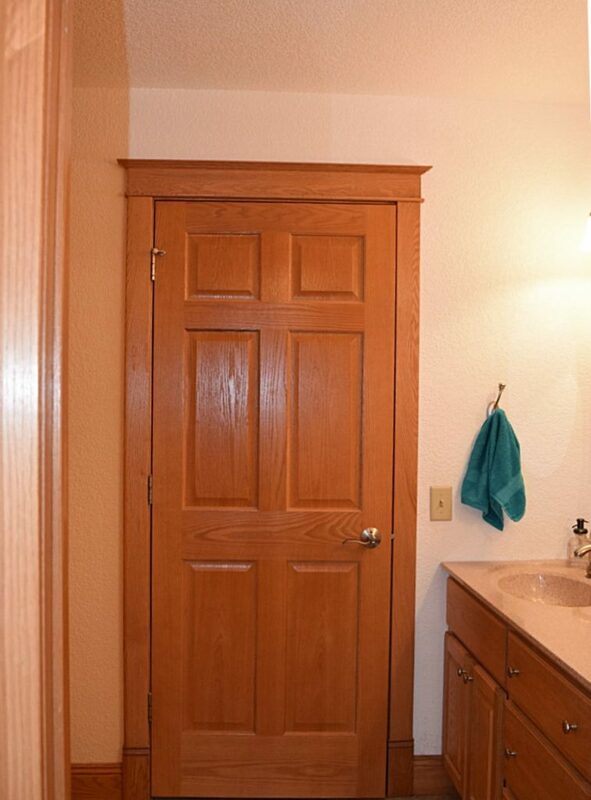 I am so excited to see what you do in this bathroom! Thanks Erin! We are so excited to do those shelves! We look forward to sharing the space with everyone! Something visual in the space will help so much! Such a great space to work with though. Thanks Ashley! We sure are looking forward to updating this space! There’s alot to be done! A bathroom feels weird to me when i see it without tiles from floor to ceiling, like we do here in Greece! Glad to meet you ladies! There is a lot to be done, but such a great project to work on. So thrilled to meet you as well! Hope you follow to see our finished project! Let us know what you think as we go. We would love to hear your comments. Sounds like a good plan! 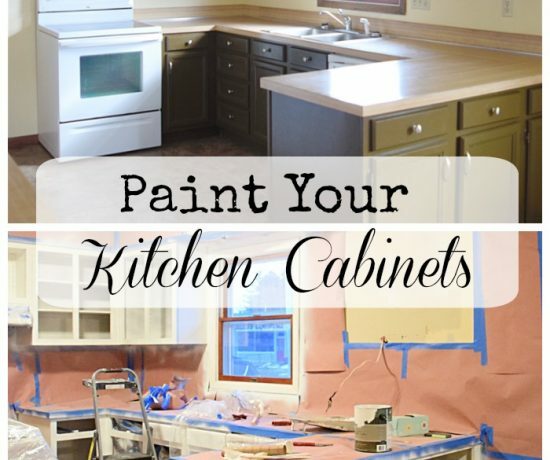 Are you going to be painting the wood doors and trim, etc? Thank you Eliesa! Glad you like our plan for the bathroom! We do not plan to paint the doors and trim as they match all the rest of the doors and trim in the house. Oh I love the idea of aqua! I’m doing a bathroom too so I can’t wait to follow along and be inspired! Yes, the aqua is one of my favorite colors! I currently have that color in my laundry room and I love it! I would love to hear what you think after I update the color! Instead I’m making over my bedroom because we always put ourselves last. This is the first time I’ve done something like this and I’m excited and already inspired by everyone. It’s definitely going to be fun! This is going to be great! 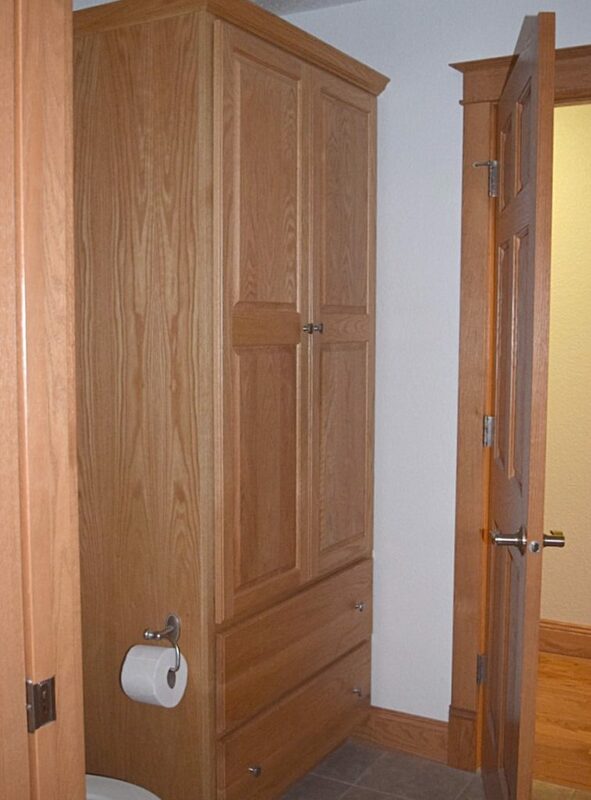 So jealous of all of that storage – I can’t wait to see what you come up with! Thank you Kim! Yes, I am blessed to have that storage to work with. I can hardly wait to get this space finished! Looks like a great room to work with! I am looking forward to seeing how it turns out! Sounds great ladies! I am buying a mirror for my powder room, but I am using credit card points for it. You’re right, that would have blown half my $100 budget. I also re-framed a mirror for our entryway recently, and that saved a lot of money, especially because the mirror is massive!! Great ideas! I’m looking forward to seeing those shelves! Thanks Jillian! We are anxious to make them! Amazing what a coat of paint and accessories can do to a room! Can’t wait to see your space next week. Can’t wait to see those walls painted! It’s going to be so different. Sounds like a great plan for the space! You ladies have a really nice space to work with. I can’t believe the storage you already have in that room! Can’t wait to see what you come up with for the shelves and of course, how it all comes together. Thank you Amy! All that storage definitely gets used! haha! What a great space you have to work with! Can’t wait to see the new colour on the walls! Shelves are a great idea, both for visual interest and storage! Thanks Maureen, can’t wait to get those shelves up! Looking forward to seeing what you come up with on your budget! Thanks for joining Monday Social. Thank you Eilis! 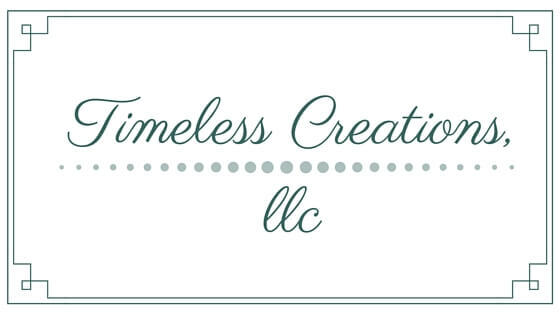 We can’t wait to share the finished project with everyone! 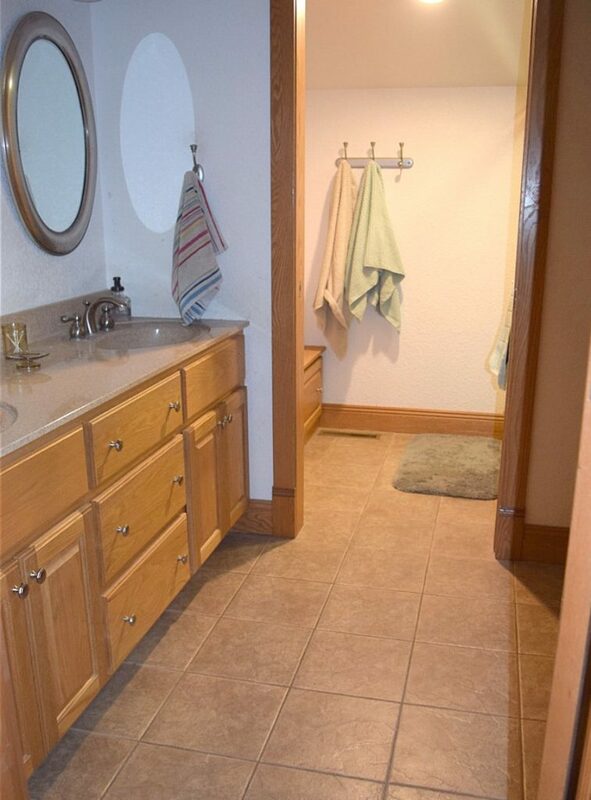 Wow, such a nice big bathroom. I love your ideas and am looking forward to seeing how it all turns out! Thank you Angie! We are sure looking forward to finishing this room! Awesome ideas and I can’t wait to see how it turns out! Aqua on the walls sounds great to me! Thanks so much for sharing at Sweet Inspiration!! Im excited to see how it all turns out! m You’ve got quite the list, and I’m sure you’ll do it all wonderfully! 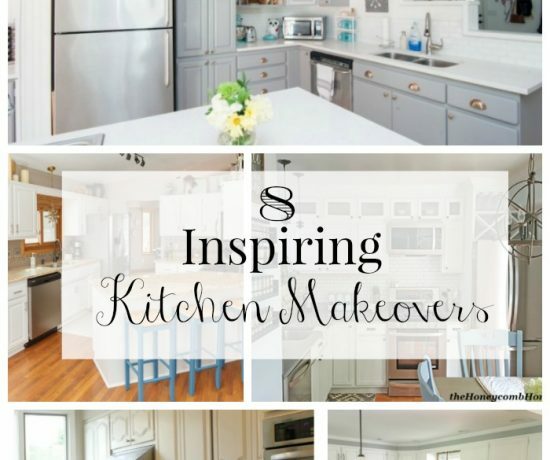 This is really good way to change things up around the house and stick within budget! Love this idea! I can’t wait to see what you do with this space!